I know MMM was Nigeria's nightmare. 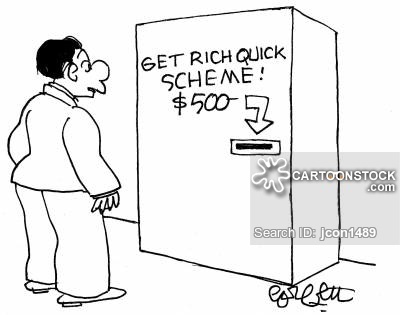 According to Wikipedia, A get-rich-quick scheme is a plan to obtain high rates of return for a small investment. But can we just truthfully attest to the fact that MMM enhanced the living of too many people, finance - wise. Can we just truthfully attest to the fact that it enhanced the persuasive skills of many people? I know the damage it did was crazy but then, there are just some good things it did in the lives of many people. Not just MMM but many "Get-Rich-Quick" scheme. The concept of "Get-Rich-Quick" schemes is for you to invest your money, multiply it and get off the scheme. But due to the greediness of too many people, they simply want to continuously multiply their money. Being rich is very relative. If I'm very broke now and suddenly get credited with N50,000, I would say I am very rich at that moment. But if a billionaire suddenly looses his money and is left with just N50,000, he would feel like the poorest person on earth. Being rich means having enough to sustain you and still be able to save out of it. So, if I have N50,000 and need N80,000 for a project and suddenly hear of a scheme that promises N100% return and eventually invest my money in it and get N100,000, what happens is that I have participated in a "Get-Rich-Quick" scheme which has enhanced my pocket, doubled my money and I'm still very able to save as much as N20,000. The system of such schemes do not expect you to keep investing. You consequentially invest at your own risk! I remember attending a MMM training once and the trainer mentioned and pointed out in one of the slides about the risk involved and clearly mentioned that the scheme can close down at anytime if the amount of people coming in are larger than the money being made. It would crash because there is not enough money to pay back investors. Why do you think the first set of people to invest in these schemes make a lot of money but when more and more and greater amount of people join, the system automatically crashes? That's because people do not understand the law abiding this system. This can be attributed to greediness. The thing is to invest once and get out. It is not networking where you are expected to keep working hard to bring in people before you can get your money back. It is a scheme that simply wants to help you multiply your wealth. Once you've done so, you're expected to leave. Now, everyone enters into a business to "gain", to "profit" and to also "double their wealth as much as they can". This is the same mindset of anyone that starts a "Get-Rich-Quick" venture. They are also into it to gain just as you are in it to gain. The only difference is that you are expected to double your wealth once but they would be able to double their wealth a thousand times if you continue investing and triple the amount of people that started the business enter into it. And since the system is at this time under attack, it would crash automatically. The owner of the scheme doesn't want it to really crash because he is enjoying the flow in of wealth but the system itself cannot stand or survive anymore and therefore crashes BY ITSELF. The endpoint is that the owner wins and you loose. He wins because he has made just enough but you loose IF at the time of its crashing, you re-invest your money again. The same goes for someone investing in the system for the first time. 1. Do your homework - Be sure it's a functional system. Not just from online testimonies because all that could be framed to attract people. Instead, inquire from more than 2 different people who have invested in the system to be sure it's a FUNCTIONING SYSTEM. 2. Discover the time frame - If it's been running for more than 3 months, put the least amount you have. If it's been running for more than 6 months, it's now a risk. I would advice not to invest at this point because the probability that the system is dwindling is very high. If it's been running for up to a year, don't even bother. People feel that for it to have survived a year, then it's a good one. That's a fatal lie. It can fail and crash at any time. Case Study - MMM. 3. Don't invite anyone - The people running it or leaders in the scheme might advise you to invite other people. They're doing it for their own selfish purposes and you shouldn't try such. Your purpose is to simply double up and leave. I've been involved in a scheme where I invited someone and we both lost. I had to pay her back the money she lost because it was her rent money. Trust me, it wasn't funny because it wasn't a small money. It's better you loose alone than loose and also have many other people loose because of you. People who don't have any chill can throw you in jail. Be wise. 4. Do it once and get out - If you decide to reinvest because of how juicy the offer is, you're on your own. I've explained how the system works and more investments would lead to greater loss. Once you've made your money, I would totally advise you to invest your money in a more reputable venture and not another "Get-Rich-Quick" scheme because such investments are done at your own risk. You are at much disadvantage by doing so.